Active Exhaust- Theory of operation from the factory. Thread: Active Exhaust- Theory of operation from the factory. The purpose of the Active Exhaust Valves are to reduce exhaust noise in the big 6.2 and 6.4L Hemis in order to meet and pass EPA noise regulations. (We hot rodders didn't ask for this!) The Active Exhaust Valves consist of two parts. First is the mechanical butterfly valves that are welded into the exhaust pipe on each bank. Mounted to each of these is a smart electric actuator which has a power, ground and bus feedback wire. They are connected to the mechanical valves through a transmission spring. The spring is used to help reduce heat from transferring between the mechanical butterfly valves and the actuators. The Active Exhaust Valve actuators communicate with the Powertrain Control Module (PCM) over a LIN Bus circuit. The Active Exhaust Valve actuator 1 (left) and Active Exhaust Valve actuator 2 (right) each has a unique part number/internal ID. The PCM can identify each actuator location by this unique ID. The PCM sends a position command to the Active Exhaust Valve actuators based on engine torque, rpm and vehicle speed. The Active Exhaust Valve actuators move the butterfly valves to the commanded position. An internal Hall Effect sensor counts the pulses and determines valve position. The valve actuators are calibrated at every Key-ON event. The PCM sends full open and full closed commands and checks actual against commanded position. If for any reason the calibration is unsuccessful , the actuators are self-diagnosing and report fault flags to the PCM over the LIN Bus. If the valve position doesn’t match a predetermined calibration, a performance code is set and the valves will default to the full open position. If an actuator is not attached to the mechanical valve, or the transmission spring is broken or missing, the actuator will continue to rotate indefinitely and set a fault. Also, if the mechanical valve is stuck and will not move, a fault will set. NOTE: There is a crossover in the exhaust, upstream of the valves that will allow the exhaust to flow through the open valve in the event one of the valves is stuck closed. NOTE: If the transmission spring breaks or the valve becomes disconnected from the actuator for whatever reason the valve assembly likely will cause a rattling noise with the engine running. Engine running longer than 25 seconds. Engine running above 500 rpm. Coolant temperature above 25°C (77°F). No Active Exhaust Valve 1 or 2 Actuator communication faults. The actual Active Exhaust Valve 1 or 2 Actuator position does not match the commanded position. This diagnostic runs with the ignition on or engine running. The Active Exhaust Valve 1 or 2 Actuator sees invalid data on the LIN Bus. The Active Exhaust 1 or 2 Valve Actuator defaults to open position. Last edited by MagnumClub; 07-06-2016 at 08:54 AM. i have installed a complete hellcat exhaust on my magnum 6.1 ,is it possible to control the active valve manually by wired it the positive et negative connector with a switch or a potentiometer? 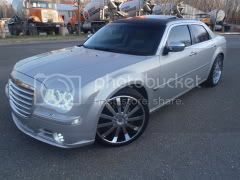 300c awd 2006 full,grip grill,noesp mod,tranzformer,MTCM,amg paddle shifter mod, diablo catch can,eagle intake,lxmodguy throttle body,ported head,268 comp cam,Trinity,Johan custom tune,cai mopar,jet 180 degre,razors edge tower brace,6.1 oem headers,6.1 oem midpipe,6.1 oem cat back,BC coilover ,22"maas coventry,255/35/22 continental dws,rer mygig,dod-tech gs600,back up camera,8000k hid ds1,8000k foglight ,sonar tail light,headrest screen,full srt8 interior,oem srt8 bumper,oem srt8 trunk spoiler,flaschtech halo 10000k. No it is not. The actuator has three wires. Positive, ground and BUS (data). Positions are communicated via computer language (laymans terms) between the PCM and the actuator itself. The actuator has a microprocessor that communicates over the BUS wire with the PCM and vice versa. It's much more complicated than a simple switch or potentiometer. The actuator looks for a language command over the BUS to open or close. I can't imagine (for your set up- not a car that came with this exhaust) to wire up a couple of R/C servos and operate the valves with them. I would think you could even run them partially open in that case as well. Black from the waist up. That cutout works differently than the active exhaust. Imagine a throttle body with a 1" hole cut out of the center. During low torque/throttle demand the blade stays closed/partial closed and exhaust flows through the center hole. During high torque/throttle demand the blades open up like a throttle body. This is all happening inside the exhaust pipe. The cutout you have pictured is added to an external opening of the existing exhaust piping and vents to atmosphere. That's why you don't see street legal cars with the cutout in your pic. - 2017 Charger 5.7 R/T Super Track Pak, Ceramic Tinted windows, Purple interior trimming, Tinted Tails/sidemarkers, RBG Demon Eyes, Whole car splitter kit, 5000k LED Headlights, ZL1 rock guards, ZL1 Wicker Bill Spoiler, Ikon rear diffuser, Vinyl exterior accents everywhere!, Hemi Fever Tunes, Diablosport Intune i3/PCM. 2005 Magnum RT amd 2017 Charger SRT 392! If I understand correctly how this particular FCA system works, you wouldn't want this system to be manually controlled. It's a restrictor really, that's why it's computer controlled to meter the opening to meet engine speed and demand. Probably do more harm than good running through the restrictive pin hole, especially if you hammer it to make a last minute pass and 'forget' to open them. You really want cutouts in your case to go open tubes or to normal full size muffled exhaust only. 2005 Magnum RT and 2017 Charger SRT Maximum Steel! You are correct, it probably wouldn't be good to have it operate manually. However...if one was so motivated, that service controller COULD be wired to the throttle to open proportionally to the throttle. Would it be as simple as it sounds? Probably not, but we are some creative folks. I'm thinking plunger behind the throttle pedal...some mechanical trigger for the servo controller (like a nitrous trigger), so the drive by wire voltage isn't altered or tampered with. That's just the first idea that popped up, not having gone to the car and studied things. It will code out if you don't control it through its CAN communication system. Since it does communicate to the pcm Mayne there's a tuner out there that can keep them open all the time, like when the srt models are in race mode. Kinda like turning off the rear o2 sensors or egr on old diablo tuners. i run the car presently with the valve closed (cup don't like loud exhaust)if i run normally the valve could be closed,i just want to open when i want . He has a HellCat exhaust on a Magnum...the controller isn't there to start with, so it won't code. My engine tuner just told me to remove them completely, not to wire them open, but just get them out 100%. There is a spring with four "Tabs" that you can turn to increase or decrease spring tension, to adjust the open/close of the valves. Maybe this style could be utilized, in his case?